# An astronomical event you may want to know about! # Public Viewing Event & Night Obs. for credit. Let your cursor hover over any date for more information about an event on that date. The Astronomical Observatory is housed under a four meter diameter dome on the Boca Raton campus of Florida Atlantic University. We welcome students, faculty, staff and members of the general public to join our scheduled observations or our public viewing events. Our telescope is mounted on a small platform, at the top of stairs, looking out of the roof of our building, over Boca Raton, to space and beyond! A student observes a sunspot. Location: We are located in South Palm Beach county, on Florida Atlantic University's Boca Raton Campus in the Science Building, #43, 4th floor, Room SE-434. Maps: This Google maps link shows our location at: 26° 22' 23.85" N latitude and 80° 06' 05.05" W longitude. Or use the information on the parking map provided by the campus. Jump to the Parking Locations section on this page, for particular information regarding visiting. Solar Observations: Mondays & Fridays: 11:00 a.m. — 1:00 p.m.
Night Observations: Tuesdays & Fridays: 7:00 p.m. — 11:30 p.m. NOTE: student credit is not offered for public viewing events, please read below. Our twice-a-month Public Viewing sessions are regularly scheduled on the 1st Friday and 3rd Tuesday of each month in place of our student's regular observations. However, this schedule may get altered due to events that have a particularly special astronomical interest. Schedules that become altered due to either an event of astronomical interest or due to some other event (such as a University-wide football game) will be discussed about on the Front Page of the website and will be listed in our Events Calendar. There is NO charge for these Public Viewing sessions. While anyone may attend these viewing sessions, students should not expect to receive credit for these sessions. Please note that night sessions are conducted in our night mode , which uses all red lights. We do this to avoid blue lights, which oversaturates our rod sensing cells in our eyes, temporarily degrading our night or scotopic vision. Night vision is what people use to see the faint nebular fuzzies up in the sky, and it takes about 40 minutes to build up to its full strength. As white light contains blue in it, we need to avoid it as well. So as a curtesy to other visitors please turn off cell phones and PDAs for your own and other's sake. If you need to take flash photographs, please use a red filter on the flash. Thank you. 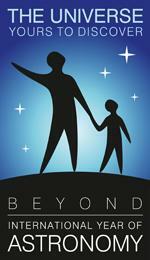 We currently offer additional credit for FAU students' Introduction to Astronomy class. The amount of the credit offered is 50 points for a night session and 30 points for a solar session. Though students may come as often as they like to any of the lectures, attendance is accredited only once per semester. We record your attendance with a sign-out sheet . Observation sessions continue throughout the semester, however once reading days or finals start, the observation sessions for credit for that semester ends as students should focus their energies and their time on their studies for their examinations. The for credit lectures will be provided even if the weather does not provide favorable conditions for star gazing. As the lectures begin promptly, please show up on time so you can follow the discussions. If you can not make the regularly scheduled observation time, you can contact me for an appointment, however, you do not need to make an appointment for an already scheduled session. And yes, your friends and/or family may attend the sessions, after all, it is their universe, too! 1.) CHECK THE WEATHER. The General Sky Conditions links on the Observatory's Front Page include weather conditions as well as information about what is up in the sky. The Clear Sky Clock for Boca Raton provides information for the sky conditions for astronomers. In general, the darker blue a square is for a described hour, the better the conditions. The best conditions have columns of dark blue blocks for the hour. Clicking on the colored block bar of the Clear Sky Clock leads to more in depth coverage. Cloud cover - If you can not see the stars due to clouds, then you can not see them through an optical telescope either. Microscopic water droplets in clouds act like lenses, reflecting, refracting and redistributing light, which blurs stellar images. Radio telescopes can "see" through clouds, but we don't have those. Transparency - Describes the atmosphere's clarity due to a lack of humidity, better transparency means better viewing conditions for nebulae and galaxies. Seeing - Describes the atmosphere's stability, a less turbulent sky means better viewing conditions to see the details in planets. There is often a reciprocal behavior between the transparency and the seeing. 2.) CHOOSE YOUR CLOTHING FOR THE WEATHER. While the Observatory is inside the campus's Science Building, you will experience outdoor conditions when the dome's doors open to the outside for there is no glass separating you from the outdoors. A glass covering could not be made well enough to avoid disturbing a telescope's view. Domes need to be open for some time so that the temperatures can stabilize with the outside, otherwise, convection (where hot air moves up as cold air moves down) occurs. Looking at a star, while the air inside of the dome convects with the outside, shows a disturbed view of the star, just like looking through a mirage across a hot road on a summer's day or up at a light from the bottom of a pool. To avoid this, the dome is opened so that the air temperatures equalize and becomes more stable. Thus, it may be rather hot or cold in the room when you come. 3.) CHOOSE YOUR CLOTHING FOR COMFORT AND DECENCY. Ladies, I do not recommend heels nor skirts. The stairs to the platform are steep and you may have to wait a while on them for your turn. And then once you are there, you may have to deal with the uncomfortable idea that there may be people looking up at you from the room below. I suggest you plan accordingly. Of course an additional consideration for decent night sky viewing, is to have skies that are not filled up with man made sky glow. More information about this artificial intrusion into the wonders of the heavens can be found at this link of Light pollution vs. Astronomy page. From I-95: take the Glades Rd. exit in Boca Raton and head east. At the West University Drive / NW 10th Ave. interchange, turn left onto W. Univ. Dr. The road will turn eastwards and you will see the stadium on the left. As you drive up to it, you will see the Recreation and Fitness Center on the right. Take the parking lot entrance immediately after the Rec. Center and park in Lot 4 with the red lines. The Observatory is on the top floor of the Science Building in room 434. FAU tag holders can regularly park in Lot 4 after 6 p.m. for night observations. The parking restriction of faculty and staff only for the Lot ends then. Visitors to FAU's campus who want to attend a public viewing night observation, parking is now permitted to you in the same Lot 4, just outside the Observatory, from 6:30 p.m. to 2:30 a.m.
A map of the Campus with parking information came be found at this link here. We are on the eastside of the roof of building 43, which appears near the center of the map. A closer view of the new parking lots and roads can be accessed at this link here. In this image, our building and the Observatory on the top appears here on the far left side of the image. Florida boosts no mountain at all in the state. Its highest point is on the slope of a hill that peaks in Georgia. Having a high location normally benefits an observatory as it allows them to look above an interfering atmosphere that blurs their views. The state is also almost totally surrounded by ocean and has plenty of lakes, which increases the humidity here. So what benefit does Florida offer to astronomy to boost so much astronomical glass to be invested here? Well, there are a lot of people in the state with time to look up and enjoy the heavens and many of them remember just how enjoyable clear, dark and starry night skies are to behold. But besides having such a populace interested in Astronomy, I can think of five major benefits that Florida offers to the science, especially for America. Florida is further south than most of the country, so the southern objects and constellations appear higher in our skies. We then look at them through less of the atmosphere than the rest of the country does and so they are easier to see here. An example of such a southern object is the awe inspiring, central bulge of our home galaxy, the Milky Way. We are also further east than most of the country, hence night appears here sooner. For any astronomical changes that may occur in our skies, such as in the cases of novae, we have an earlier chance to spot them before the rest of the country does. Finally, because of our southern location, the atmosphere's jet stream current that so often blurs the views of the skies for the rest of the country, rarely reaches down here in Florida. Our atmosphere is often more stable than what the rest of the country experiences. Hence, the amazement and appreciation of amateur astronomers when they come down from the rest of the country to either visit or to retire here. Perhaps it isn't much to boost of, but they are astronomical advantages to our state. If people would better protect the night skies by eliminating the light pollution here, then astronomical tourism to the state would be greater as well. I think that "Come to Florida for the beautiful oceans to relax at during the day, and the oceans of stars to enjoy viewing at night!" could be a winning advertising campaign for the state, don't you? If you are ever interested in getting into Observational Astronomy, then I often recommend a good book to get started so that you know how to do it, where to look, what it is and what does it mean. One that I feel that is an excellent introduction the practice and does all of it well is Terence Dickinson's NightWatch by Firefly Books. I especially how he incorporates a variety of facts about the various celestial objects right in his star charts. We have welcomed many different groups to come to visit our observatory, from school classes, to extracurricular groups and day camps. On cloudy days or evenings, we will still offer lectures or video presentations to our visitors. Daytona Beach: Embry-Riddle Aeronautical University has a 1 meter Ritchey-Chrétien telescope at their Observatories. Orlando: the University of Central Florida has a 20" Richey Chrétien telescope and other Schmidt Cassegrains at their Robinson Observatory. Orlando: the Orlando Science Center has a 10" Refractor and more at its Crosby Observatory. Cocoa: the Eastern Florida State College (formerly the Brevard Community) has a Planetarium & Observatory housing a a 24" Ritchey-Chrétien reflector on their campus. Cocoa: the Brevard Astronomical Society is a Brevard-area amateur astronomer group that often is affiliated with the Student Astronomical Society of F.I.T. and the Kennedy Space Center Amateur Astronomers. Melbourne: Florida Institute of Technology's Astronomy & Astrophysics Group runs the 0.8 meter (32") Ortega Telescope & Observatory on its campus. Fort Pierce: the Treasure Coast Astronomical Society meets on the main campus of Indian River State College in Fort Pierce, which also houses the Hallstrom Planetarium. Fort Myers: the Evelyn L. Egan Observatory is on the campus of Florida Gulf Coast University. Their observatory features a 16-inch Ritchey -Chrétien reflector telescope. West Palm Beach: the Astronomical Society of the Palm Beaches volunteers time at the South Florida Science Center and Aquarium's observatory that is offered during their Nights at the Museum event. Boca Raton: the Eyes to Skies program at the Children's Science Explorium is offered at Sugar Sand Park, which is off of Military Trail, just south of Palmetto Park Road. 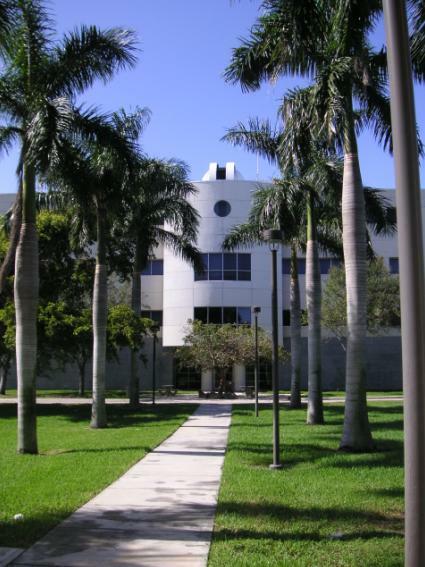 Davie: Broward College has the Buehler Planetarium & Observatory on its campus. Sunrise: the South Florida Amateur Astronomers Association runs Fox Observatory in Markham Park. Big Cypress Preserve: Astronomy Nights at the Big Cypress National Park has some of the darkest night skies in the eastern United States! Park Rangers and their astronomy partners conduct outings under awesome night skies! Miami: Booker T. Washington Senior High School has a great Planetarium for students and public viewings. Miami: the Florida International University has their The Stocker AstroScience Center with the addition of their 24" ACE telescope. Miami: the Patricia and Phillip Frost Museum of Science hosts their 250-seat planetarium. Website: Jason Higley runs the great Florida Astronomy webpage on all the Observatories and Astronomy happenings through out Florida. Nicely done Jason! FAU has a 14" Celestron Edge HD Schmidt-Cassegrainian telescope that is mounted on a new Losmandy HGM Titan Equatorial Drive system. Plus, we have upgraded to a new Daystar 0.5Å Quantum Professional Edition Hydrogen-α filter. This offers us an image uniformity that has a peak transmission guaranteed within a FWHM of 0.5Å to beautifully enable us to see prominences "live" on and above the Sun's chromosphere. All of these new additions were made possible by FAU students through a grant from the FAU's Technology Fee. This is something that you and the community will be able to utilize and enjoy for years to come! 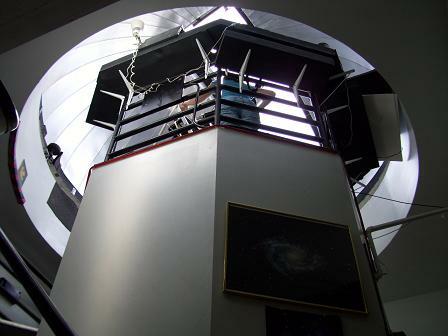 As the observatory does not have its own foundation and suffers from image blurring vibrations from the building's machinary or from people, we have mounted our telescope and equatorial drive on pedestal that incorporates a newly and rather uniquely designed (and continuously worked on), vibration dampening system. This system is uses an interalized weighted "keel" with a vibration dampening, "wiffled" tube, which sits in about 7.0 gallons of a highly viscious silicone oil from Dow-Corning. The top end of the keel is attached the top plate of a set of parallel plates that sandwiches a set of helical isolating springs and bricks of lead, as seen in the image here. The lead provides the inertia for the springs to work against as the vibrations come from below. Very much like the shock absorbers on your car, the majority of the car's mass rests on top of the absorbers. When your car hits a pothole, the shocks push your wheels down to help keep the rest of the vehicle moving evenly along. The keel hangs down through a large hole in the bottom plate, so it is not connected to it. The sandwiched springs absorb some of a vibration's shock energy. The energy that does pass through them will cause the keel to move or oscillate a bit, which then will have to move through the viscious oil. The oil causes drag forces on all of the keel's surfaces, which dampens out the vibrational energy. The added dashpots help slow down side to side tilting. Yes, you can still make the telescope shake if you try to, but the shaking comes to a stop much faster now than it ever did before. This design was suggested by FAU's machinist Jeff Webb and then worked on Jeff and by FAU's other machinists Fredrick Knapp, Mark Royer, and myself. We also have the following accessories for our telescope: a Losmandy Gemini Computer for deep sky objects, a Spectroscopic filter, CCD cameras, a new Broad-Spectrum Solar filter for the new telescope to view sunspots. Finally, we have also started a collection of meteorites for display. If you wish to learn more about meteorites, I would recommend a visit to Washington University in St. Louis.